There are newer versions of this map available. To see them, view all Syria updates. Subscribe for full access to all conflict map reports! 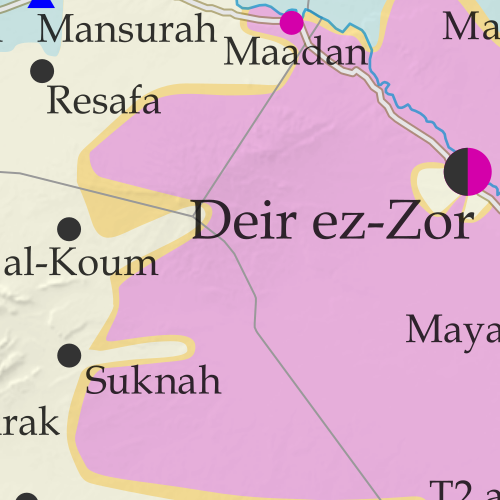 In the past month, the so-called "Islamic State" (ISIS/ISIL) has lost vast swaths of territory in the center of Syria to government forces, leaving the western end of its main territory completely surrounded. Meanwhile, Syrian and Lebanese forces have cleared out ISIS and hardline rebel forces who controlled areas along both sides of the border with Lebanon. See all this and more on the latest update to PolGeoNow's concise, professional Syrian Civil War control map, which includes a timeline of changes since our previous Syria map report in July, with sources cited. This map and report are premium content, available to paid subscribers of the PolGeoNow Conflict Mapping Service. Want to see before you subscribe? Check out our most recent FREE SAMPLE Syria map! Up-to-date illustration of current territorial control in Syria, color-coded for the Assad government, rebel groups, "Islamic State" (ISIS/ISIL) fighters, and Kurdish/SDF forces. Colorblind accessible. Markers showing the approximate locations of Russian-Turkish-Iranian "de-escalation zones" and the one known US "deconfliction zone". Special symbols indicating towns dominated by rebels of the former Nusra Front (now Hayat Tahrir al-Sham) and US-backed Syrian Democratic Forces (SDF). Detailed indication of city-by-city control, including key towns and other locations important to current events. Locations of recent fighting and other important events, including Raqqah, Maadan, Suknah, al-Koum, and more. Detailed timeline of important events and changes to territorial control since July 21, 2017, compiled by our Syria-Iraq expert, with links to sources. Not signed up yet? Click here to learn more about our professional subscription service! Can I purchase just this map? This map and report are not available for automated purchase to non-subscribers. If you need access or republication rights for only this map report, contact service@polgeonow.com for options. Categories: asia, conflict zones, divided countries, isis, kurdistan, lebanon, middle east, rebel control, syria, the "islamic state"